Not only has [Joop Brokking] built an easy to make balancing robot but he’s produced an excellent set of plans and software for anyone else who wants to make one too. Self-balancers are a milestone in your robot building life. They stand on two-wheels, using a PID control loop to actuate the two motors using data from some type of Inertial Measurement Unit (IMU). It sounds simple, but when starting from scratch there’s a lot of choices to be made and a lot of traps to fall into. [Joop’s] video explains the basic principles and covers the reasons he’s done things the way he has — all the advice you’d be looking for when building one of your own. He chose steppers over cheaper DC motors because this delivers precision and avoids issues when the battery voltage drops. His software includes a program for getting a calibration value for the IMU. He also shows how to set the drive current for the stepper controllers. And he does all this clearly, and at a pace that’s neither too fast, nor too slow. His video is definitely worth checking out below. The Mini Maker Faire in Atlanta was packed with exciting builds and devices, but [Andrew’s] Electric Bubblegum Boards stood out from the rest, winning the Editor’s Choice Award. His boards first emerged on Endless Sphere earlier this summer, with the goal of hitting all the usual e-skateboard offerings of speed, range, and weight while dramatically cutting the cost of materials. At just over 12 pounds, the boards are lightweight and fairly compact, but have enough LiFePO4’s fitted to the bottom to carry a rider 10 miles on a single charge. A Wii Nunchuck controls throttle, cruise control, and a “boost” setting for bursts of speed. The best feature of this e-skateboard, however, is the use of 3D-printed parts. The ABS components not only help facilitate the prototyping process, but also permit a range of customization options. Riders can reprint parts as necessary, or if they want to just change things up. [Andrew’s] board is nearing the 11th hour over at his Kickstarter page, so swing by to see a production video made for potential backers, or stick around after the break for some quick progress and demo videos. 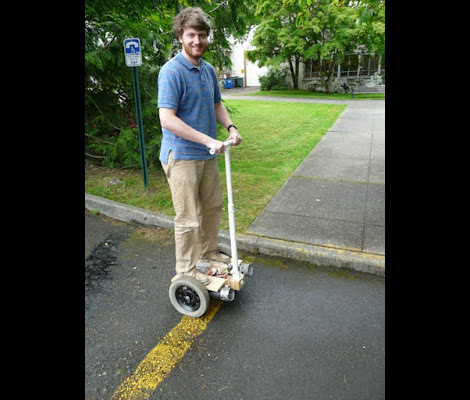 [Matt Turner] tipped us off back in January about his homemade Segway project. Unfortunately that message slipped through the cracks but we’re glad he sent in a reminder after reading Friday’s feature an a different 2-wheeled balancer. We like it that he refers to this project as being on the budget of a graduate student with a young family. We certainly understand where he’s coming from, and we hope he can ride this to job interviews to show them he truly lives engineering. The control circuitry is a bit higher-end than we’re used to seeing. He chose a Cypress CY8C29466 SoC to control the device. But the sensors are a common choice, using the Wii Motion Plus and Wii Nunchuk for the gyroscope and accelerometer they contain. This is a no-brainer since the sensors are high-quality, cheap and available locally, and communicate of the standard I2C protocol. When looking for motors [Matt] was happy to find an old electric wheelchair on Craig’s List. This also gave him a gear box, wheels, and tires. He added a pair of motor drivers, with his own alterations to suppress feedback. Sounds like they run a little hot because he plans to add cooling fans to them in the future. But this first iteration is up and running quite well as you can see in the clip after the break. 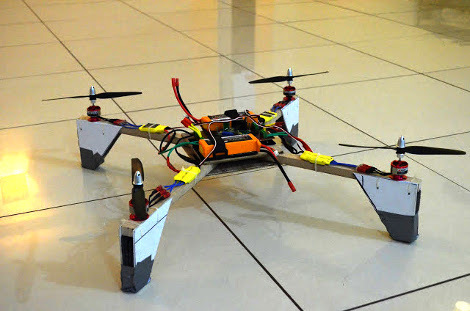 [Abhimanyu Kumar] has been hard at work building and posting about his quadcopter. So far he’s published ten installments for this build, letting us relive the adventure vicariously. But it’s number 11 that we’re really excited about as he plans to share the first free-flight footage in that one. The bug was planted in his brain after hearing that a quadcopter was used to shoot some of the footage in Spiderman 2. He wanted one to call his very own but the cost of a ready-made unit was out of his league. So he decided to build one instead. The first version uses aluminum bracket for the cross making up the motor mounts. He added LEDs to liven things up and even made a demo video of the thing tied to a table (no IMU yet so free flight would be fatal). After this stepping stone he decided to go with a Wii Motion Plus and Wii Nunchuck as the positioning feedback sensors. There is also a body redesign with helps lighten the load. It’s a fun project, and we can’t wait to see where he goes from here! For a computer that debuted in the early 80s the MSX was a very respectable machine. Of course these were the days that superimposing graphics over a video was an amazing feat, but [Danjovic] and [Igor] are still having fun with their boxen. They designed a software interface for the Wii Nunchuck (translation) on their trusty MSX computer. The plug coming out the back of a standard Wiimote is just a simple I2C bus. Many things can be done with this port from plugging in ancient controllers to controlling robots. [Danjovic] and [Igor] managed to write a routine in Basic that converts the I2C data coming out of the Nunchuck to data the MSX can understand without any modification of the hardware whatsoever. All the guys needed to plug the Nunchuck into the MSX was a voltage divider and a few pull-up resistors between the computer and controller. They got data from both buttons, the joystick and the accelerometer in the Nunchuck and made a small program to display some sprites on the screen to demonstrate this. Check that out after the break. The parts laid bare in the picture above all make up a roll away alarm clock that flees when you don’t get out of bed. It’s an interesting idea, but considering most folks don’t sleep on hardwood floors we can understand why [TheRafMan] was able to pick this gem up for under $5. That’s quite a deal because there’s a very usable LCD module at the top. 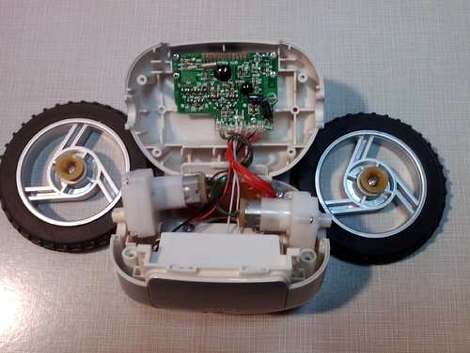 But for this hack, he focused on using the gearhead motors to make a programmable rover. In order to make this programmable [TheRafMan] had to add a microcontroller. He chose an Arduino variant, called the Ardweeny. It’s a board that piggy-backs the ATmega328. But he didn’t use a stock Ardweeny; he’s altered it to play nicely with jumper wire. The uC is able to interface with the gearhead motors thanks to an L293D h-bridge motor driver chip. As you can see in the clip after the jump, the rover can now be driven around using a Wii Nunchuck or via a USB connection. If you’ve got a Bluetooth module lying around it wouldn’t be hard to make this a wireless solution that can be controlled with the accelerometers in a Wii remote. [knuckles904] was able to use the new Wii MotionPlus with an Arduino. Nintendo has released the WM+ in order to detect the motion of the controller better. The Wiimote only detects acceleration, whereas the WM+ detects rotation along 3 axes. The Arduino communicates with it over I2C, the same protocol that is used with the Nunchuk. To connect the two devices, he used jumper wires, but breakout boards are also available. He was able to create some example code with help from wiibrew.org. When paired with a Nunchuk, which contains a 3-axis accelerometer, you can have a 6 degrees-of-freedom IMU for under $40, perfect for controlling your robots or logging data.